Aug 27 2018 - It is a tented city of nearly a million souls crammed in just 26sq km of undulating terrain. Plastic and bamboo sanctuaries perched upon clay mounds flap in the wind, succouring the hapless Rohingyas who fled horrific violence in Rakhine. Shrubs and trees gave way to settlements in Ukhiya and Teknaf Upazilas in the southernmost district of Bangladesh sitting on the edge of the tumultuous Bay of Bengal. As the monsoons descended, rainfall triggered mudslides and floods as the soft clay collapsed in heaps, bringing down some of the flimsiest shelters that form the world’s largest refugee camp—Kutupalong/KTP, or more popularly, the Mega Camp. In addition, smaller camps dot the southern tip of Teknaf between the Naf River flowing down in muddy torrents from the Arakan mountains. For a layperson, the sight of the camps in the monsoons is chilling, though experienced humanitarians will appreciate the massive effort it took to create this landscape. The UN Secretary General António Guterres has poignantly captured both sentiments when he called it “a miracle—on the edge.” Closely monitoring the Bangladesh Meteorological Department reports, we pray for the weather to be kind. While record-breaking rainfall has lashed the camps, the wind factor has been limited, though for how long? September storms and the October-November cyclone season are still to come—a daunting reality in the absence of cyclone shelters in the area. Until it holds, the bit-by-bit efforts of building mud-track roads and bridges, digging drains, culverts and water channels, strengthening clay slopes with bamboo and sandbags have ensured some safety in a fragile environment. Shelter upgrade kits comprising ropes, bamboo and tools have been widely distributed to strengthen fragile homes. Efforts to improve safety continue, including through the Ministry of Disaster Management and Response-led Cyclone Preparedness Programme and its volunteers, training refugees on disaster response. 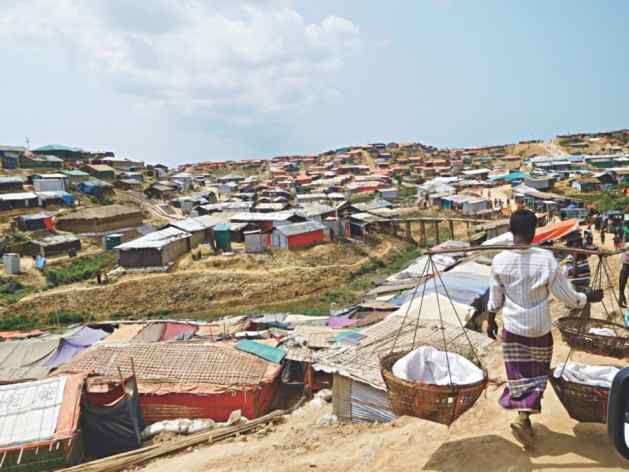 Relocation of those at high risk continues as camps become more congested; vulnerable families uprooted from their homes and communities agonise about moving “yet again” away from their neighbours and village folk. Convincing the families of the risks of being on a 40-degree mud slope or at its bottom—sure to flood—challenges the persistent community volunteers. Latrines and water points jostle for space and, during heavy rains, merge into the other. The risk of disease is high and breaths are drawn as frequent water contamination tests determine results. Amidst shoring up to survive an “emergency within an emergency”, little boys and girls play with their multi-coloured wrist strips attached to identify them in case of family-separation in a disaster. None of the prevention work would be enough on its own: in an emergency situation, it is the inspiring commitment demonstrated by government-assigned camp officials, military, United Nations staff, national and international NGOs and refugee volunteers who unhesitatingly wade through thigh-deep mud and slush to assess damage or conduct repairs even though it is pouring—this camaraderie has prevented casualties, helped move families to safety, repaired roads and bamboo bridges, as all joined hands with site maintenance teams to fix damage as rapidly as humanly possible so that the majority of refugees could retain access to food distribution and safer shelters. Having worked for over three decades with forcibly displaced persons, I have rarely seen a refugee population as maligned and downtrodden, yet I am repeatedly amazed by their spirit. The Rohingyas, young and old, women and men, display an inner strength. Generations of statelessness and persecution have left them proudly resilient. They have so little, yet remain community-oriented. I can now begin to comprehend how orphaned children, single women, as well as injured and disabled individuals, all managed to flee from Rakhine. An overwhelming 80 percent of refugees in the camps are women and children who are eager and impatient for opportunities to live a full life. The vulnerability of this population is astounding—as is their tenacity. They manage to survive as community networks in the camps are strong, staying together, sharing and working hard. Their spirit is the backbone of this response. South Asia is not new to refugees. None of the states have signed the Refugee Convention, yet a strong tradition of asylum endures. The 1947 partition of India resulted in over 14 million people uprooted in the most violent manner. They could have become refugees overnight in the new dominions of India and Pakistan, if both states had not immediately absorbed them. The liberation of Bangladesh in 1971 displaced an estimated 10 million refugees to India. Like most refugees, nearly all chose to return to their liberated homeland once Bangladesh was created. It is perhaps this memory that guides the generosity of spirit in Bangladesh, despite its own constraints of population density and natural disasters. One year ago, the most recent influx of the Rohingyas began. They fled to Bangladesh at a staggering pace; some 500,000 refugees arrived within the first month. Undoubtedly, the main responder and largest donor have been the government and people of Bangladesh as the local community opened their homes and hearts. The world community has notably stood alongside Bangladesh, as evidenced by the rapid international response to the influx. Now, one year on, as the generosity of the local community risks being outpaced by the sheer scale of needs, the international community needs to continue their partnership and to walk the talk. The Joint Response Plan (JRP) launched in March 2018 is a prioritised appeal for USD 951 million to assist 1.3 million individuals including 884,000 Rohingyas and 336,000 affected Bangladeshis. The JRP is just about one-third funded, at 34 percent. Urgent funding is critically required to meet life-saving humanitarian needs. More than half the appeal (54 percent) is for food, water, sanitation, hygiene, shelter and non-food items combined. Food alone is 25 percent of the overall appeal while just 18 percent of food security needs are funded. Some 850,000 refugees require food rations monthly; health care, both psychosocial and physical, as well as other basics for sustainable human life are needed. Camps remain dangerously congested, and most refugees lack adequate shelter from high winds and heavy rains. Children have lacked education for years: in Rakhine, they were denied, now we need funds and access to quality education to prevent a generation of lost children. Protection needs are significant and the impacts of funding gaps are alarming. Through no fault of their own, the Rohingyas have been forced into near-complete dependency on aid compelled by inadequate attention to self-reliance initiatives. Humanitarian responders have maximised their available resources to the extent possible, but the needs far outweigh existing capacity. Important projects remain pending and the expanse of protection activities remains limited. Multiple government departments have stretched themselves in addressing the needs of not only an underdeveloped part of the country but of a million more in an area lacking previous infrastructure. Admirable progress is being made, however, including rapid establishment of governance systems marking the assertion of state authority through Camp-in-Charge officials and the Office of the Refugee Relief and Repatriation Commissioner expanding their previous ambit. Much is being achieved through fostering the innate strength of the Rohingya community, keen to overcome the traumas that forced their escape. This work is done every day by individuals in women’s groups, child-friendly spaces, as well as elderly and disabled support networks. This work is also done through more systemic changes, such as restructuring how camp representatives are elected to provide equal opportunity to the majority female population to contribute to social cohesion. But more is needed to support and mutually sustain a protection-sensitive environment. The Rohingya crisis is the most globally compelling refugee situation in terms of the numbers of people affected. These numbers are exacerbated by location, terrain and climate, adding to the complexity of the response. The historic joint visit of the UN Secretary General and the World Bank President to Cox’s Bazar in July underscored the need for collaborative humanitarian and development action. Given remarkably early on in the crisis, the World Bank Refugee Grant to Bangladesh demonstrates the flexibility of an international community in addressing an unusual situation. The nimble response by the Asian Development Bank also echoes a similar approach. Quick and visible implementation is critical. One year on, as we await improvements in Rakhine, one that will allow for a voluntary repatriation process, the here-and-now is more imminent. Will we continue to manage the situation as we have this past year? Or will we seize the initiative? Can we turn around a seemingly confounding situation to mutual advantage for both refugees and the local population? A well-planned common vision can boost an underdeveloped district in a country already on the fast path to growth, one that facilitates access to opportunities for both refugees and local communities alike. Plans are being tested in Cox’s Bazar to merge development opportunities with humanitarian work. These plans must deliver for the sake of the Rohingyas and for Bangladesh—a country that has bucked the global trend by demonstrating humanity in action. Their courageous leadership deserves all our support. Sumbul Rizvi is Senior Coordinator of the Rohingya Refugee Response in Cox’s Bazar.